The future of Quality Assurance and Testing is here. Successful Quality Assurance requires solid methods that cover all aspects of a project to ensure a foundation is created for product quality, reliability and process efficiency. As the Multiverse grows and expands, more platforms, technologies and software applications must work seamlessly together to ensure proper user experiences. This model requires contact advancements in testing methods, processes, automation tools and more to properly launch software products to market. 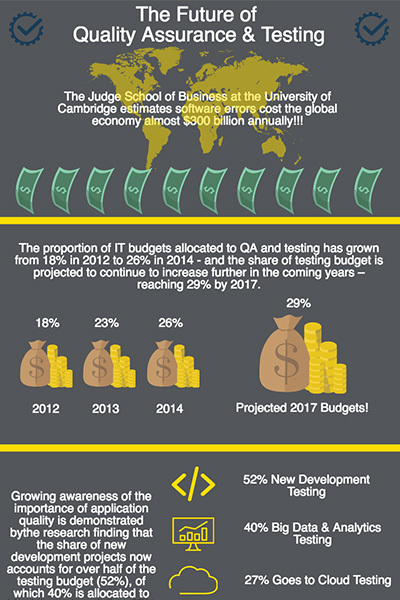 Download our latest infographic and learn how the QA and Testing industry is changing, and what it means for your business moving forward.